Learner-Centered Assessment on College Campuses integrates current thinking and research regarding the learning of undergraduate students with principles of best practice in assessment and teaching. The book will help readers see the connection among three powerful trends in higher education today: the focus on learning and learners, the emphasis on the assessment of learning, and the need to continually improve what those in higher education do. Grounded in principles of constructivist learning theory and continuous improvement, the text provides opportunities for readers to make connections with what they already know about assessment, integrate new information with their current knowledge, and try new approaches to enhance the learning of their students. Readers will consider what it means to shift from a teacher-centered paradigm of instruction to a learner-centered paradigm. The book offers practical approaches to help formulate intended learning outcomes, gather feedback from students to guide instruction, and develop scoring criteria for guiding and evaluating student work. Readers will learn how to assess students' ability to think critically, address enduring and emerging issues and problems in their disciplines, and use portfolios to promote and evaluate student learning. Numerous questions to guide implementation, as well as examples from a variety of disciplines and institutions are provided. 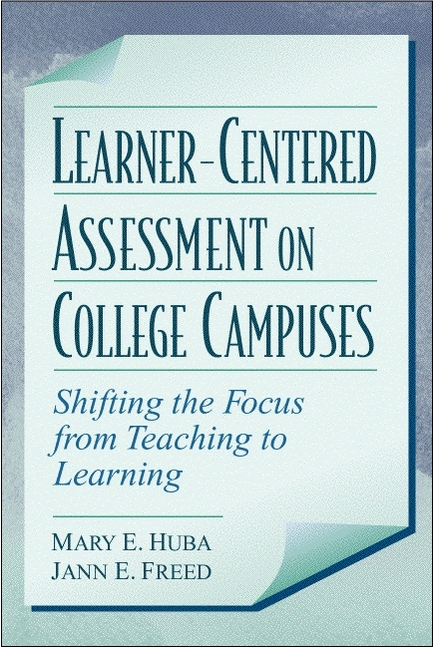 Focuses on new techniques in college teaching and assessment which help the reader understand best practice as it is currently defined in higher education. Numerous examples give the reader direction for understanding and implementing new techniques and concepts. “Making Connections” questions, where readers can reflect on what they already know and what they want to know about the topic of the chapter, and experience a new learning technique that can be used with students. “Reflections” questions that occur after each section of the text give readers the opportunity to reflect on new information and its implications, helping them to understand new information more deeply. “Try Something New” at the end of each chapter makes readers more receptive to changing teaching practice. 1.Experiencing a Paradigm Shift Through Assessment. Teacher-Centered and Learner-Centered Paradigms of Instruction. A Systems Perspective on Learner-Centered Teaching. Elements of the Assessment Process. A Brief History of the Assessment Movement in Higher Education. Assessment and the Improvement of Undergraduate Education. Figure 1-1: Importance of Learner-Centered Teaching from the Viewpoint of Prominent Leaders in Higher Education. Figure 1-2: Comparison of Teacher-Centered and Learner-Centered Paradigms. Figure 1-3: The Assessment Process. Figure 1-4: Abbreviated Statement of W. Edwards Deming's Fourteen Points for Continuous Improvement. Figure 1-5: Deming's Fourteen Points Adapted for Education. Figure 1-6: Attributes of Quality Undergraduate Education: What the Research Says. Figure 1-7: Allocation of Professor's Time/Effort/Emphasis in Teacher-Centered and Learner-Centered Paradigms. 2.Understanding Hallmarks of Learner-Centered Teaching and Assessment. Learners Are Actively Involved and Receive Feedback. Learners Apply Knowledge to Enduring and Emerging Issues and Problems. Learners Integrate Discipline-Based Knowledge and General Skills. Pause for an Example: Differences between Typical Teaching Practice and the First Three Hallmarks. Learners Understand the Characteristics of Excellent Work. Learners Become Increasingly Sophisticated Learners and Knowers. Professors Coach and Facilitate, Intertwining Teaching and Assessing. Professors Reveal That They Are Learners, Too. Learning Is Interpersonal, and All Learners — Students and Professors — Are Respected and Valued. Figure 2-1: Hallmarks of Learner-Centered Teaching. Figure 2-2: A Learner-Centered Example from Business Management. Figure 2-3: A Learner-Centered Example from Construction Engineering. Figure 2-4: A Learner-Centered Example from Forestry. Figure 2-5: A Learner-Centered Example from Mathematics. Figure 2-6: A Learner-Centered Example from Sociology. 3.Applying Principles of Good Practice in Learner-Centered Assessment. Principles of Good Assessment Practice. Key Questions to Consider When Establishing or Evaluating an Assessment Program. Figure 3-1: Principles of Good Practice for Assessing Student Learning. Figure 3-2: Hallmarks of Successful Assessment Programs to Assess Student Academic Achievement. Figure 3-3: Sample Matrix for Assessment Planning, Monitoring, or Reporting. Figure 3-4: Suggested Roles for Administrators in Assessment. Figure 3-5: Key Elements in an Assessment Plan. 4.Setting Direction with Intended Learning Outcomes. Benefits of Formulating Intended Learning Outcomes. Characteristics of Effective Intended Learning Outcomes. Figure 4-1: Benefits of Formulating Intended Learning Objectives. Figure 4-2: Characteristics of Effective Intended Learning Outcomes. Figure 4-3: The College of St. Scholastic Mission and General Education Outcomes. Figure 4-4: Babson College Mission and Competencies. Figure 4-5: Rutgers University Mission and University-Wide Learning Goals. Figure 4-6: Southern West Virginia Community and Technical College Mission and Learning Outcomes. Figure 4-7: Plan for Designing and Delivering Learning Outcomes. Figure 4-8: Relationship among Institutional, Program, and Course Outcomes: Example 1. Figure 4-9: Relationship among Institutional, Program, and Course Outcomes: Example 2. 5.Using Feedback from Students to Improve Learning. Techniques for Collecting Feedback from Students. Enhancing the Process of Gathering and Interpreting Feedback from Students. Figure 5-1: Sample Fast Feedback Questionnaire. Figure 5-2: Sample Plus/Delta Feedback Form. Figure 5-3: Sample Critical Incident Questionnaire (CIQ). Figure 5-4: Sample Redesigned Course Evaluation Form. Figure 5-5: Guidelines for Gathering Feedback from Students. Figure 5-6: Guidelines for Interpreting Feedback from Students. 6.Using Rubrics to Provide Feedback to Students. The Role of Feedback in Student Learning. Using Assessment to Promote Learning. Elements of a Useful Rubric. Using Rubrics to Reveal Important Information. Questions That Emerge after Using Rubrics. Enhancing the Process of Giving Feedback to Students. Figure 6-1: Rubric for Oral Communication in a Graduate Program. Figure 6-2: Program Rubric for Engine Design Project. Figure 6-3: Rubric for Economic Bill Writing Project. Figure 6-4: Student Worksheet for Developing Assessment Criteria. Figure 6-5: Alternate Form of Rubric for Engine Design Project. Figure 6-6: Developing Useful Rubrics: Questions to Ask and Actions to Implement. Figure 6-7: Determining the Criteria That Characterize Excellent Work. Figure 6-8: Deciding on the Levels of Achievement to Use. Figure 6-9: Developing Commentaries for Each Cell in the Rubric. Figure 6-10: Incorporating Weighting Factors into Alternate Engine Design Rubric. Figure 6-11: Additional Questions/Actions When Developing Rubrics for Specific Assignments. Figure 6-12: Problem Solving Rubric. Figure 6-13: Habits of Mind Rubric. Figure 6-14: Guidelines for Effective Feedback Discussions. Figure 6-15: Questioning Techniques to Support Useful Feedback. 7.Assessing Students' Ability to Solve Problems and Think Critically. Benefits of Attempting to Solve Ill-Defined Problems. Essential Components of Critical Thinking and Problem Solving. Using Assessment to Develop Critical-Thinking and Problem Solving. Characteristics of an Exemplary Assessment Task. Developing an Effective Assessment Task. Figure 7-1: A Comparison of Well- and Ill-Structured Problems. Figure 7-2: Assessment in History. Figure 7-3: Assessment in Biology. Figure 7-4: assessment in Mathematics 1. Figure 7-5: Assessment in Mathematics 2. Figure 7-6: Assessment in Chemistry. Figure 7-7: Assessment in Psychology. Figure 7-8: Assessment in Engineering. Figure 7-9: Three of King & Kitchener's (1994) Stages in the Development of Reflective Thinking. Eight Characteristics of an Exemplary Assessment Task. Questions to Ask When Developing an Effective Assessment Task. 8.Using Portfolios to Promote, Support, and Evaluate Learning. Using Selection Portfolios to Promote and Support Learning. Promoting Learning with Portfolios: Professors and Students in Partnership. Promoting Learning with Portfolios: Professors and Other Stakeholders in Partnership. Benefits to Professors of Using Portfolios. Benefits to Students of Using Portfolios. Questions to Ask When Planning to Use Portfolios in Assessment. Figure 8-1: Portfolio Goals and Related Entries. Figure 8-2: Sample Student Reflection Assignment. Figure 8-3: Self-Assessment Rubric from Alverno College. Figure 8-4: Benefits to Professors of Using Portfolios. Figure 8-5: Benefits to Students of Using Portfolios. Figure 8-6: Questions to Ask When Using Portfolios in Assessment. 9.Shifting the Paradigm: Individual and Organizational Implications. Issues in Making the Paradigm Shift. Making a Commitment to Change. Figure 9-1: Sample Teacher Learning Adult. Mary E. Huba, is a professor in the College of Education at Iowa State University, where she also serves as Assessment Coordinator. Dr. Huba teaches courses, conducts research, and consults in the areas of assessment and program evaluation. She has helped several colleges and universities refine their assessment plans and develop their assessment programs. Jann E. Freed, is a professor of Business Management and the division chair of the Behavioral Sciences at Central College in Pella, Iowa. Dr. Freed has co-authored two books and several articles on continuous quality improvement in higher education.